FLOUNDER GIGGING RATES – CALL FOR AVAILABLE DATES. Trip arranged for 2 giggers 3 person max additional $50 for 3rd person. 1648 alumacraft, 40 hp tohatsu, high pressure sodium lights, quiet generator, saftey equipment, bamboo gigging poles. 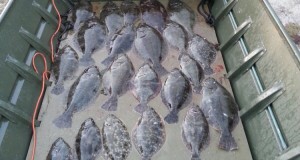 We here at Fin-Fisher Charter Services are proud to offer flounder gigging charters in Holden Beach, NC. We are the only flounder gigging charter located here in Holden Beach & Brunswick county. This is an exciting trip, join us as we navigate the winding rivers and shallow flats in the dark of night locating flounder. What is flounder gigging? In Holden Beach, NC Flounder gigging is done primarily at night by boat or if you so choose wading in the water utilizing a light source to see through the water looking for flounder laying on the floor of the river and a gig (similar to a pitchfork) so you can stick them. Here at Fin-Fisher Charter Services we choose to flounder gig by boat. We use our gigging poles to maneuver around in depths from inches to a couple of feet to look for flounder at night. To make this possible we have 4 high pressure sodium lights that light the water up under a dark sky so we’re able to see the fish. The lights are powered by a quiet inverter generator so we can still hold a conversation on the bow of the boat. While gigging you will see all forms of sea life in its natural habitats. We offer this in a 4 hour trip (which is recommended), and a 4-6 hour trip. We can accommodate up to 2 people comfortably on this trip, but can add a 3rd for a additional $50.00. Flounder gigging trips rely on the tides and weather. Trips could be really early or late into the night. Feel free to contact us if you are interested, so we can check the tides for our area and schedule your trip. Other species we will encounter and are able to gig are speckled trout, mullet, black drum and also crabs. I ask that no open toe shoes are to be worn on this trip. Thank you for choosing Fin-Fisher Holden Beach fishing charters!